In the mid 1930s, America stood on the precipice of war as Hitler's Nazi government continued to gain power. With threats to the nation growing stronger, the desire to make strides in aeronautics became a necessity. However, only a finite amount of male mathematicians were available. Thus began the long and storied contribution to space exploration by women. In 1935, NACA (National Advisory Committee for Aeronautics, later known as National Aeronautics and Space Administration after the Space Act of 1958) brought its first group of women into the fold at the Langley Memorial Aeronautical Lab in Virginia. These five women were recruited to crunch numbers, lessen the burden of the busy male engineers, and essentially act as computers long before the digital age. This was not the first instance of female involvement in the understanding of space, however. Dating back decades, during the late 19th century, women were employed at the Harvard College Observatory to collect images of stars on glass plates. One woman even classified over 10,000 stars and was the first person to recognize the existence of white dwarfs. With a history of proven capability and a looming Second World War, the use of women in the federal workforce was not as far-fetched an idea as it once appeared to be. In June 1941, with the war raging in Europe, President Franklin D. Roosevelt set about strengthening the federal workforce and abating racial strife by issuing Executive Order 8802, which banned the "discrimination in the employment of workers in defense industries or government because of race, creed, color, or national origin." It did not, however, mention gender. But when America was officially pulled into war following the attack on Pearl Harbor, NACA started recruiting college-educated African American women to work as the much-needed "human computers." These African-American “computers” were segregated in the west section of Langley, and had to use separate dining and bathroom facilities, eventually becoming known as the "West Computers." They were even forced to retake college courses and were seldom given promotions or other jobs within the committee. However, their work was sound and their contributions great. Three of the most notable figures during this time were Katherine Johnson, Dorothy Vaughan, and Mary Jackson. Katherine Johnson was born on August 26, 1918 in White Sulphur Springs, West Virginia. With an early knack for numbers, she graduated from high school at just 14 years old and attended West Virginia State University, where she earned degrees in math and French. In 1938, she became the first African-American woman to desegregate West Virginia's state college. After working for several years as a math teacher, she was hired in 1953 by NACA. Her first big assignment was mapping out the trajectories for astronaut Alan Shepard's historic trip as the first American in space, known as the Freedom 7 mission. She also had an important role in helping John Glenn become the first American to make a complete orbit around the Earth, allowing the nation catch up to Russia in the highly competitive "Space Race" during the Cold War. As part of the Space Task Group, her job was to recheck and reverse engineer the IBM 7090's trajectory calculations for the mission (known as Project Mercury). According to Margot Lee Shetterly's book Hidden Figures, which tells the story of Katherine, Dorothy, and Mary, John Glenn did not trust the IBM computer. Instead, he requested that Katherine manually calculate the trajectory. He reportedly said, "Get the girl to check the numbers... If she says the numbers are good... I'm ready to go." Dorothy Vaughan was born in Kansas City, Missouri on September 20, 1910. She graduated with a degree in mathematics from Wilberforce University in Ohio. Like Katherine, Dorothy was a teacher before she became one of NACA's early African-American “computers” during the Second World War, in 1943. An advocate for the "West Computers," Dorothy became NACA's first black supervisor in 1948. She later became an expert programmer of FORTRAN (short for Formula Translation, a program to allow for easy translation of math formulas into code). Her contributions to the Space Task Group were not forgotten, even long after she retired from NASA in 1971. Dorothy died at age 98 on November 10, 2008. Mary Jackson was born April 9, 1921 in Hampton, Virginia. She earned Bachelor's degrees in both mathematics and physical science from the Hampton Institute in 1942. She then joined the NACA team in 1951. She quickly made a name for herself at Langley, assisting senior aeronautical research engineer Kazimierz Czarnecki. With Czarnecki's encouragement, Mary set her sights on becoming an engineer. However, she needed to take after-work graduate courses at Hampton High School, which was segregated. She subsequently petitioned the City of Hampton to desegregate the school, and won. She completed the courses next to her white peers, and was eventually promoted to engineer in 1958 — making her the first African-American female engineer in history. After over 34 years of service, Mary retired in 1985, and died on February 11, 2005. Katherine Johnson would also go on to work on the Apollo program, even calculating trajectories for the moon landing in 1969. She retired from NASA in 1986, and in 2015, she was awarded the Presidential Medal of Freedom by President Barack Obama. She also had a NASA computational research facility named in her honor. She, along with Dorothy and Mary, were vital figures during the Space Race, ultimately cementing America’s place as a leading nation in spaceflight. The 2017 movie Hidden Figures depicts the lives and accomplishments of these three extraordinary women. 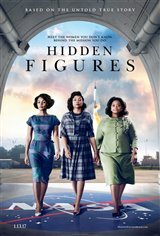 Based on the book by Margot Lee Shetterly, the film stars Taraji P. Henson as Katherine Johnson, Octavia Spencer as Dorothy Vaughan, Janelle Monáe as Mary Jackson, Kevin Costner as Al Harrison, director of the Space Task Group, and Glen Powell as John Glenn.